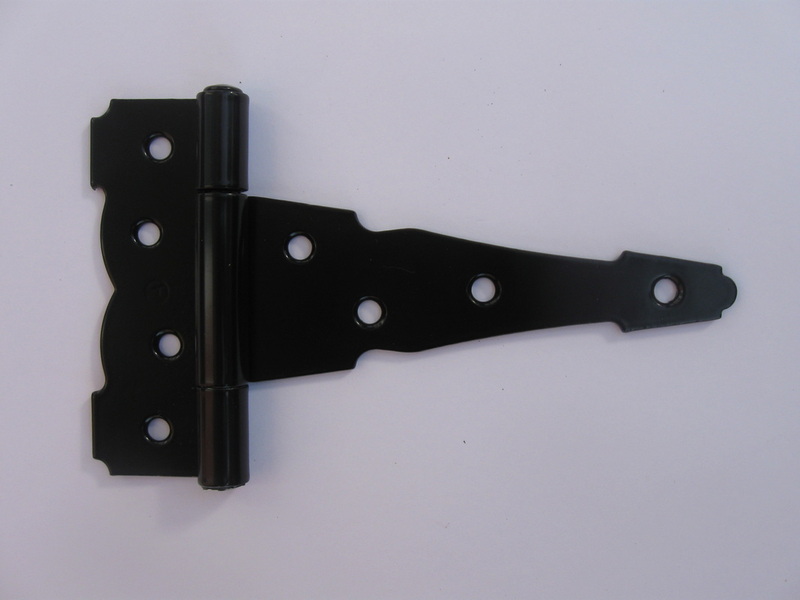 Our shed doors are acquired from a major distributor to the Amish shed builders. 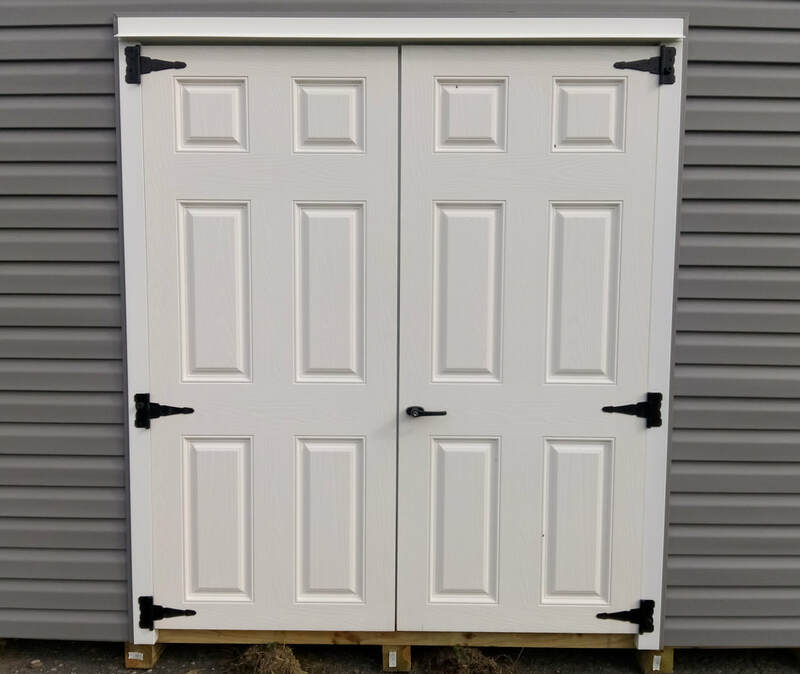 Shed doors are modified exterior house doors with 6 blocks of wood strategically placed inside each door for the screws used to fasten the shed industry's standard hinges and locks to grab on to. See installation instructions below. There are 3 blocks of wood on the hinge side and 1 block of wood on lock side of each door (inside door) for hinge/lock screws to be fastened to. We are in the process of switching from steel shed doors to fiberglass shed doors. 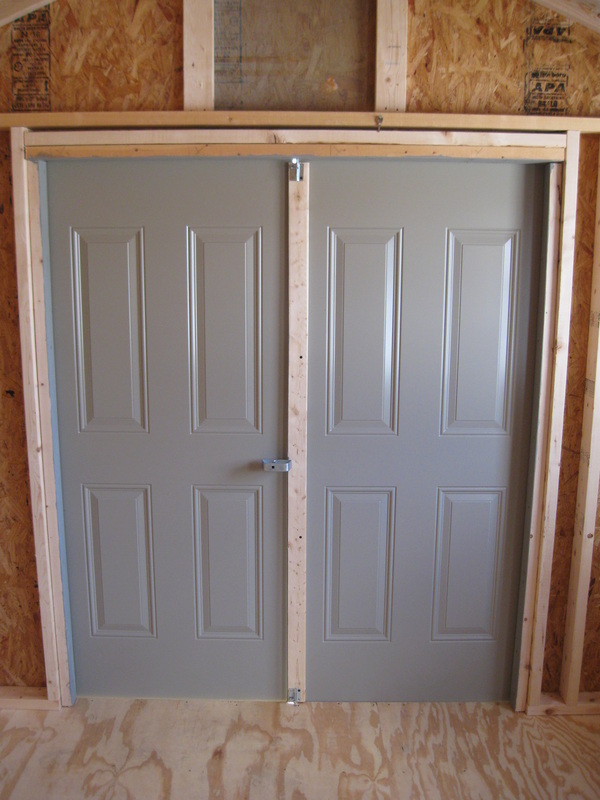 Fiberglass shed doors have 6 panels as seen in the pictures below. 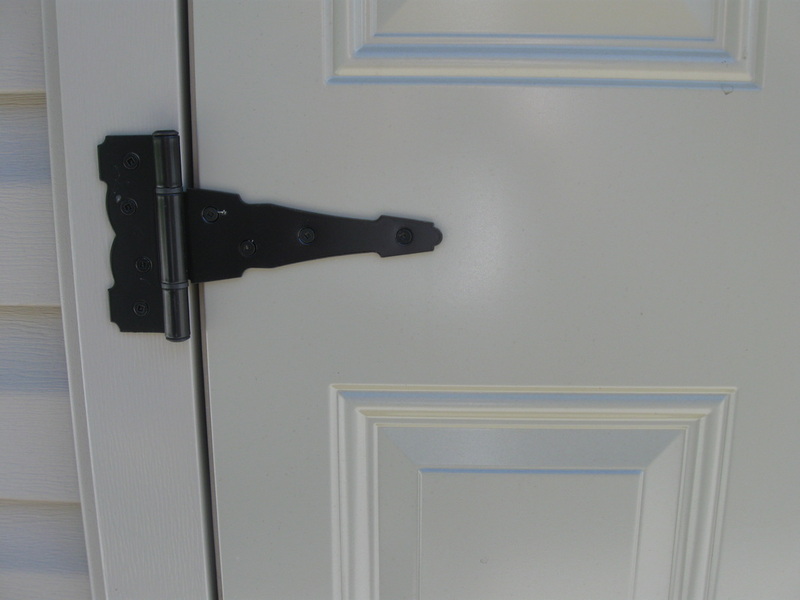 Fiberglass shed doors have 3 blocks of wood on both the right and left sides of the door for hinge and lock screws to be fastened to. 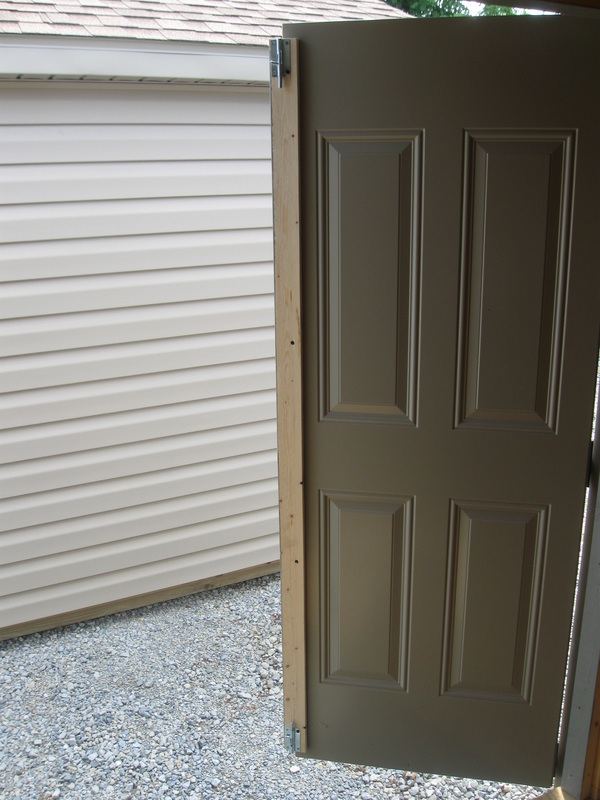 ​Fiberglass shed doors have an embossed wood grain texture. 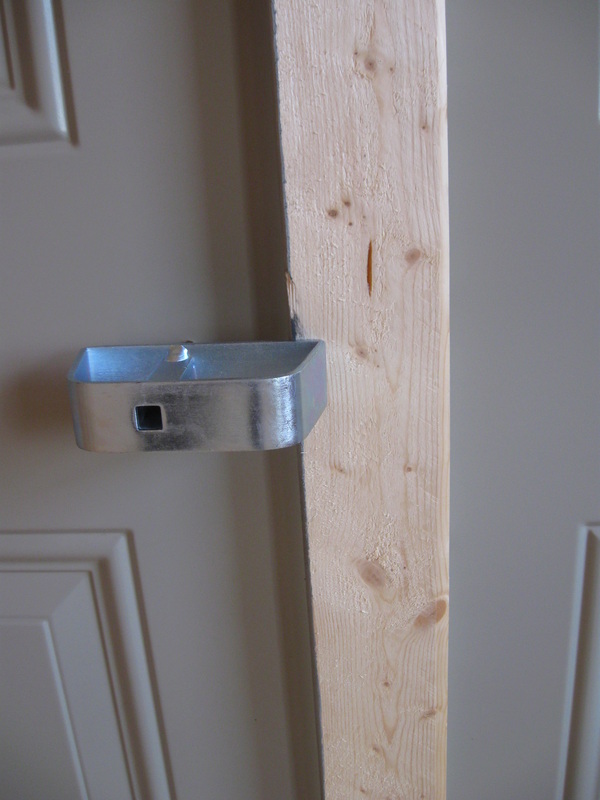 There are 3 blocks of wood on each side of the door (inside door) for hinge/lock screws to be fastened to. WE TRY TO KEEP DOORS IN STOCK! Call first to make sure the parts you want are in stock! 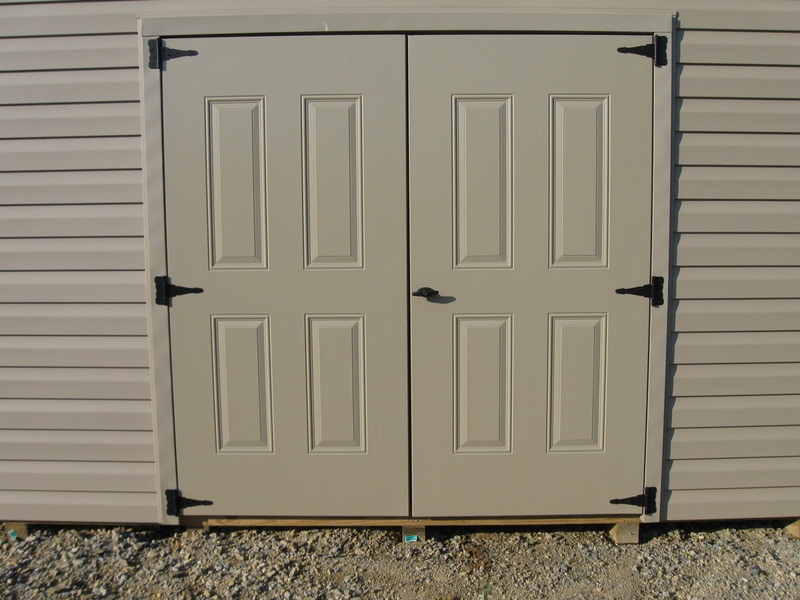 Picture of (2) 35.75" x 72" Steel Shed Doors installed on a storage shed. The doors are hung with a 3/8" gap between the doors and above the doors to prevent the doors from rubbing. The Sticker is on the hinge side of the door (steel shed doors only). 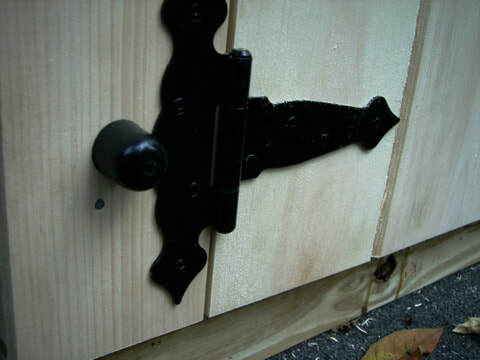 The hinge side of the door has 3 blocks of wood, placed inside the door, for hinge screws to grab onto. 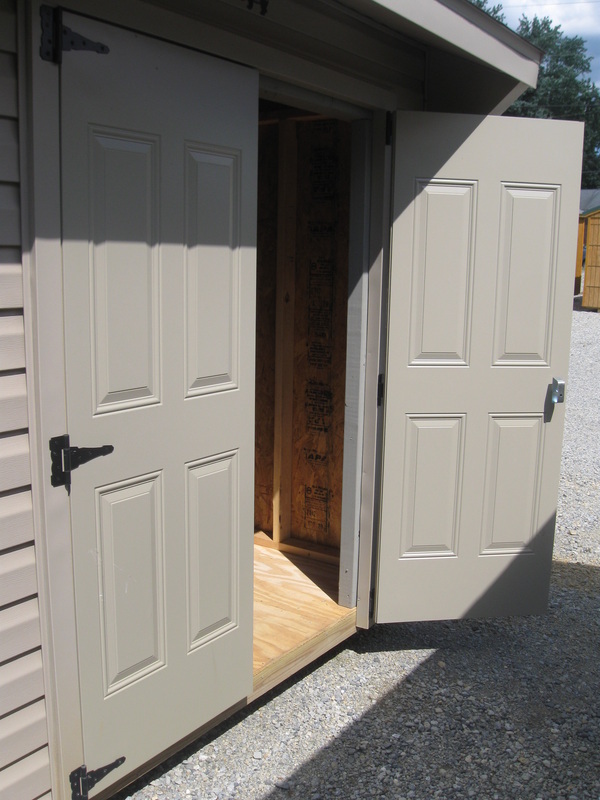 Shed doors are reversible since they have embossed panels on both front and back sides. 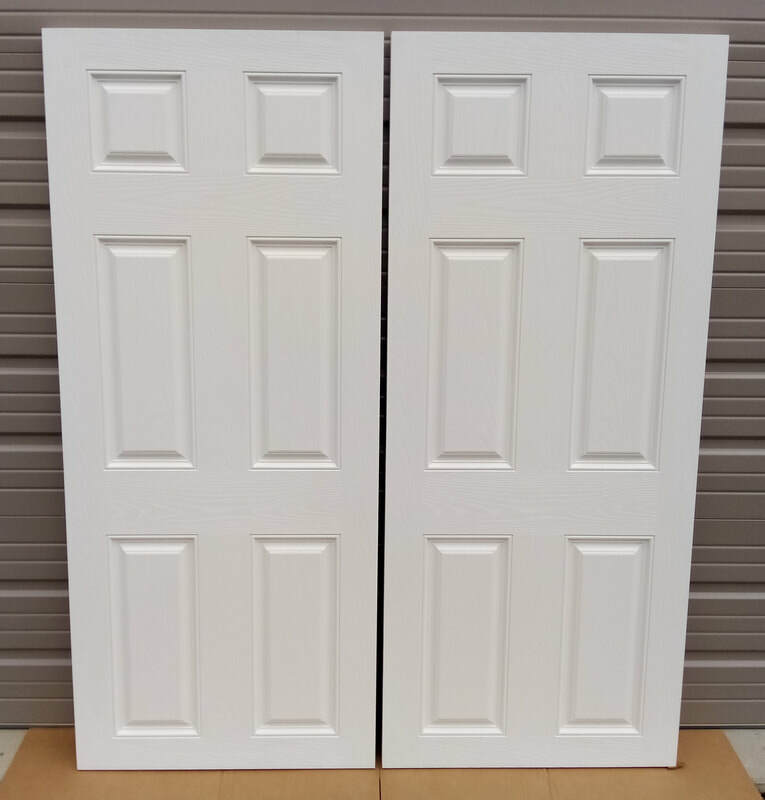 Each door can either be hinged left or hinged right. 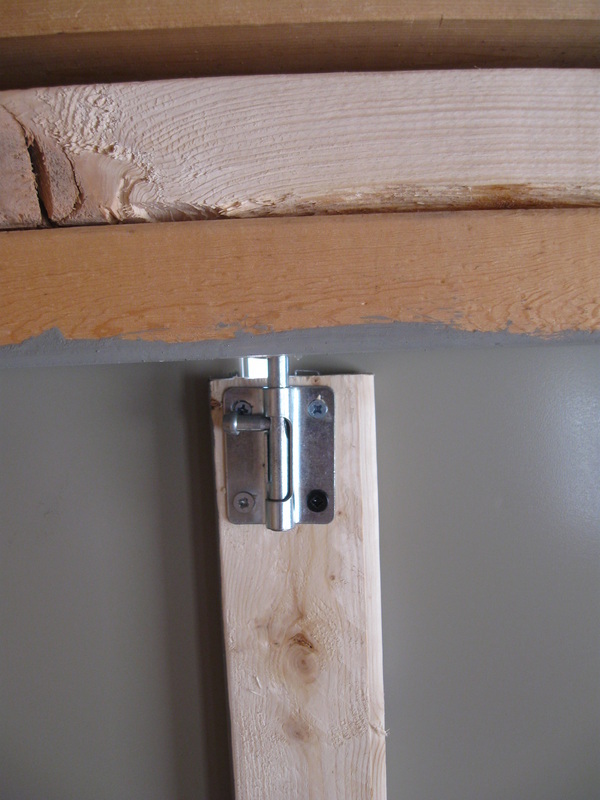 Installing top hinge: Line up top of hinge "barrel" with top of door and hinge screws will grip the block of wood inside the door. 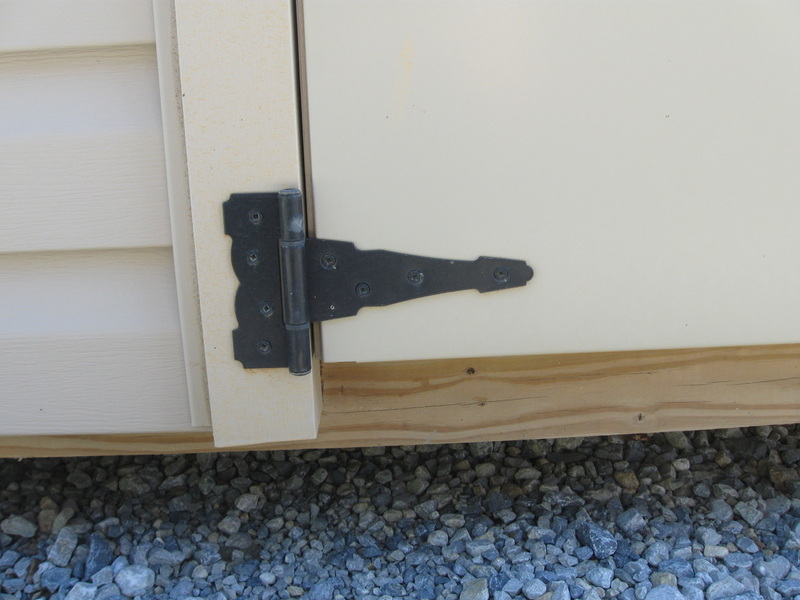 Installing center hinge: Center the middle of hinge between the two door panels and the hinge screws will grip the block of wood inside the door. Installing bottom hinge: line up bottom of hinge barrel with bottom of door and the hinge screws will grip the block of wood inside the door. 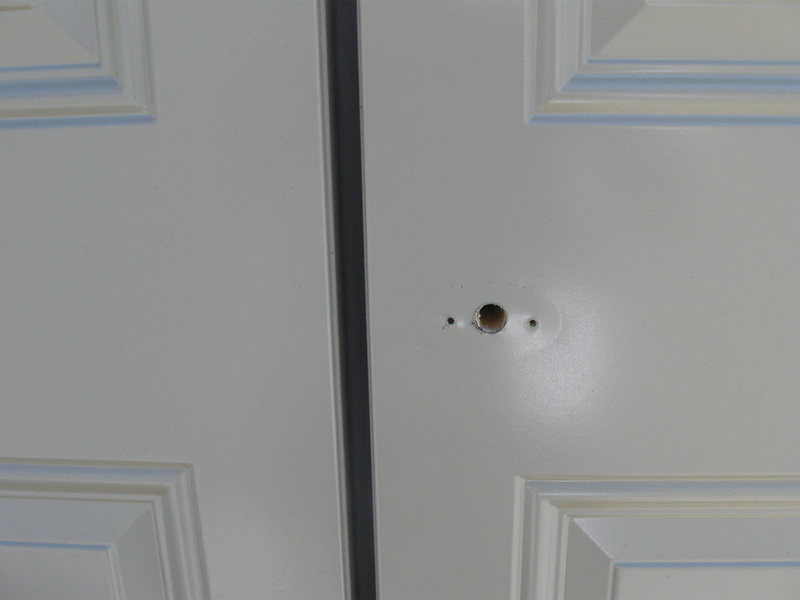 Installing Lock: drill hole for lock shaft 2" in from edge of right door and center the hole between the 2 door panels. 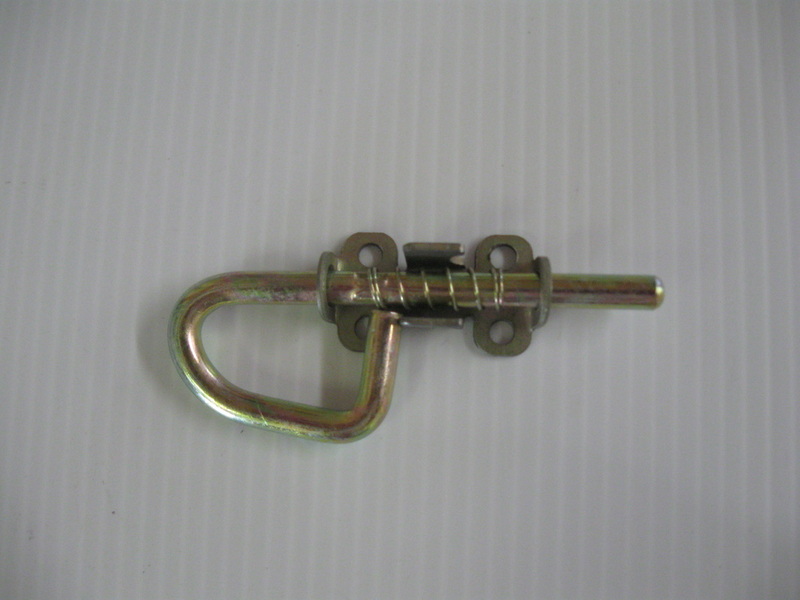 The 2 lock screws will fasten the lock to the block of wood inside the door. 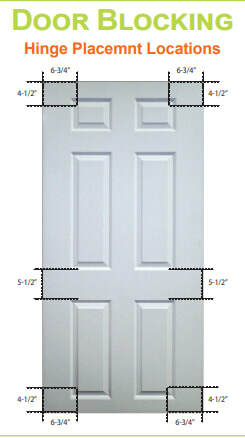 Fasten a 1"x 3" trim board to the inside of the left door (the left door when standing outside). Each steel shed door has a 1" wide strip of wood on the right and left edges (mostly inside the door, but also visible at the edges). 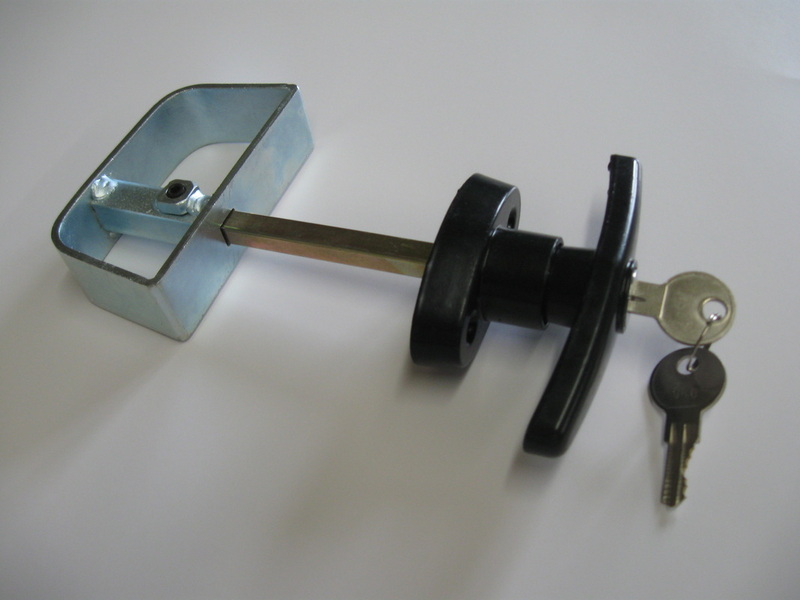 The wood 1 x 3 is what the inside door handle grabs when locking the right door to the left door. 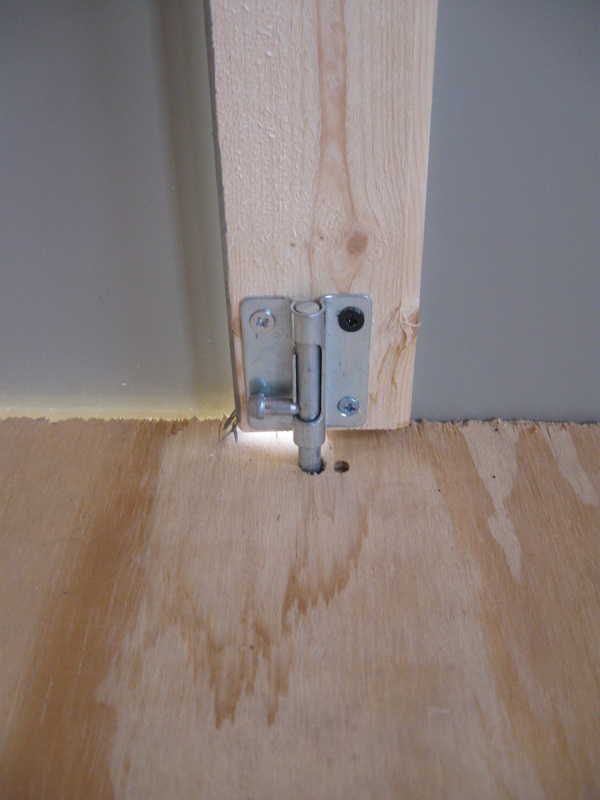 A barrel bolt is attached to the top and bottom of the 1x3 wood board. 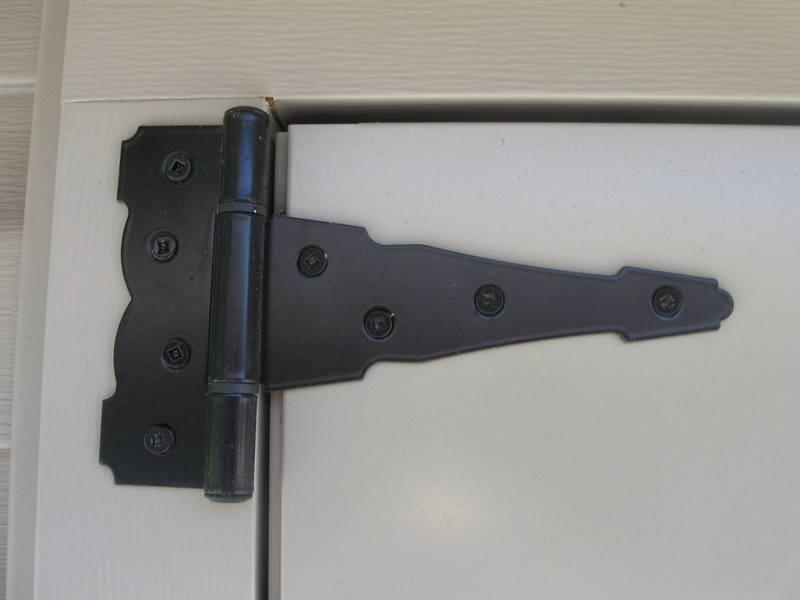 The barrel bolts are used to lock the left door. A hole needs to be drilled into the header and into the floor for each barrel bolt. Close up view of top barrel bolt (discontinued barrel bolt style pictured). We stock spring loaded barrel bolts. Close up view of bottom barrel bolt (discontinued barrel bolt style pictured). We stock spring loaded barrel bolts.